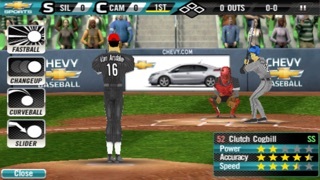 Chevy Baseball is packed full of realistic features like the ability to substitute pitchers, individual player stats which affect their abilities in-game, and a Spring Training tutorial mode which teaches newcomers the ropes. 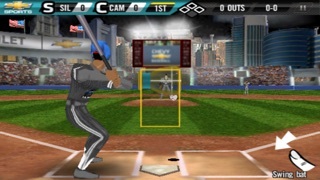 Accelerometer-based aiming controls both batting and pitching while simple tap fielding means beginner players can easily feel like seasoned pros! Two modes of difficulty allow newcomers to jump in and swing for the fences while providing the seasoned pros with more of a challenge. Not enough time for a full game? 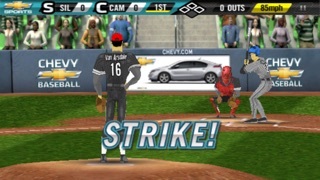 You can play a three inning game as well as a nine inning game. And you don’t have to wait to tell your friends or family about your amazing game, either. 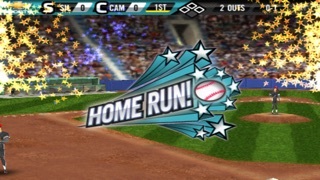 Send Postman postcards to all your favorite social networks to brag about your baseball skills! Plus+ integration allows you to track your progress around the world with online leaderboards and unlockable awards. You can also access the Chevy Dugout to learn more about great Chevy vehicles.